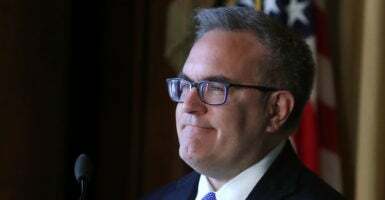 Environmental Protection Agency acting Administrator Andrew Wheeler, President Donald Trump’s pick to head the agency, is preparing for what could be the toughest congressional hearing of his life Wednesday. The Senate Committee on Environment and Public Works will hold Wheeler’s confirmation hearing as Democrats and environmentalists push for a delay. Committee Democrats tried to derail Wheeler’s hearing by calling into question his use of political and career staff to help him prepare for his confirmation hearing. Democrats suggested Wheeler’s use of EPA officials for hearing preparation may violate the Antideficiency Act. In a letter sent Friday to the EPA, Democrats also said Wheeler’s preparation during the shutdown “is diverting resources that are intended to be used to ‘protect life and property’ to prepare you for your confirmation hearing,” alleging even more dire consequences to public health. The Antideficiency Act prohibits executive branch agencies from spending money or incurring obligations outside those provided by Congress or federal law. Both EPA and the White House Office of Management and Budget said the EPA staff helping Wheeler prepare for his confirmation hearing were “excepted” from furlough, meaning their participation is legal. “EPA has excepted a limited number of employees to prepare the Acting Administrator for the hearing on January 16th,” said EPA General Counsel Matt Leopold in a statement, The Hill reported. Also on Friday, prominent environmental activists called on the Senate to delay Wheeler’s confirmation hearing while the federal government is shut down. “It is profoundly unfair for Mr. Wheeler to audition for a promotion to lead an agency while the entire agency workforce is locked out and denied their paychecks, making it difficult to pay their bills and mortgages and provide for their families,” prominent liberals, including John Podesta, former Hillary Clinton campaign chair, wrote in a letter to Senate leadership. The Sierra Club, whose executive director Michael Brune signed the letter with Podesta, hopes to dig up more dirt on Wheeler as the Senate considers his confirmation. The group won a federal court victory in early January ordering EPA to release 20,000 emails between industry groups and more than two dozen Trump administration officials, including Wheeler, within 10 months. Wheeler began serving as EPA’s acting administrator in July after former Administrator Scott Pruitt resigned amid a flurry of ethics allegations. Critics have pointed to Wheeler’s lobbying work for Murray Energy, a coal company whose founder donated $300,000 to Trump’s inauguration in 2017. Wheeler’s supporters say Democrats and environmentalists don’t want to see him head the EPA because he’s a Washington, D.C., insider and experienced attorney who can effectively implement Trump’s agenda. “He understands how the regulatory process works and the type of effort that is required to develop effective and legally defensible regulatory reforms,” said Jeff Holmstead, a former George W. Bush administration EPA official who is now a partner at Bracewell LLP. Wheeler can expect a tough grilling before Congress, but is likely to be confirmed since Republicans increased their Senate majority in the 2018 midterm elections. Wheeler may even peel away a Democrat or two, including West Virginia Sen. Joe Manchin. “Although the Democrats don’t always agree with him, they like and respect him, and I am confident that he will be confirmed,” Holmstead said in an emailed statement. Even so, Wheeler should not expect any support from Democrats on the committee. Its ranking Democrat, Delaware Sen. Tom Carper, was critical of Wheeler’s handling of the EPA since July. “I’ve been very disappointed in acting administrator Wheeler’s performance with regard to making progress on those issues and to charting a new course for the agency’s future,” Carper said in a statement.